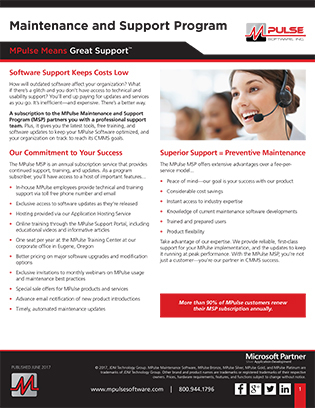 MPulse maintenance software solutions fit businesses of every size. Whether you run a small maintenance shop or manage maintenance for a large enterprise, we have a software package that’ll make your organization more productive and profitable. 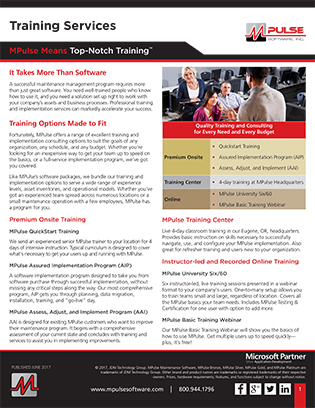 With four robust software editions to choose from—Bronze, Silver, Gold, and Platinum—you can be sure you’re getting a flexible solution that works everywhere. Understand the various editions of MPulse and what's included with each. Ideal for: Maintenance managers. PM tracking and work orders. MPulse Bronze is an entry-level solution for preventive maintenance (PM) and work order management. Our Bronze package helps maintenance teams gain better control over their scheduling and tracking processes so they can use resources wisely and measure results accurately. Ideal for: Maintenance managers & facility managers. Includes service request management. 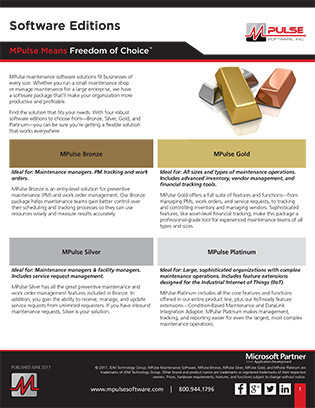 MPulse Silver has all the great preventive maintenance and work order management features included in Bronze. In addition, you gain the ability to receive, manage, and update service requests from unlimited requesters. If you have inbound maintenance requests, Silver is your solution. Ideal for: All sizes and types of maintenance operations. Includes advanced inventory, vendor management, and financial tracking tools. MPulse Gold offers a full suite of features and functions—from managing PMs, work orders, and service requests, to tracking and controlling inventory and managing vendors. Sophisticated features, like asset-level financial tracking, make this package a professional-grade tool for experienced maintenance teams of all types and sizes. Ideal for: Large, sophisticated organizations with complex maintenance operations. Includes feature extensions designed for the Industrial Internet of Things (IIoT). MPulse Platinum includes all the core features and functions offered in our entire product line, plus our IIoT-ready feature extensions—Condition-Based Maintenance and DataLink Integration Adapter. MPulse Platinum makes management, tracking, and reporting easier for even the largest, most complex maintenance operations. Use your smartphone, barcode scanner, or mobile device to find data in our system-wide search or Inventory Clerk. Visualize maintenance schedules with calendar views, so your team can see what needs to happen when. Establish, monitor, and execute time- and meter-based PM schedules. Comprehensive work order management with asset-level tracking capabilities, advanced routing, and highly configurable status reporting. Provides simple records of inventory items and enables you to track and report on consumption of those items. Simple-to-create, easy-to-read graphic reports. Choose from a wide range of chart and graph types. This highly configurable “command center console” puts your most important data front and center, where you don’t have to dig for it. Manage all facets of employee records: status, skill level, billing rate, and more. Easily match employees to the assets they maintain, and assign tasks accordingly. Link from MPulse to important documents, videos, photos, supplier websites, intranets, and more. Transfer your data safely, cost effectively, and with reduced business disruption. Compatible with standard file and data exchange formats. Maintenance customers can enter and initiate service requests and monitor the progress of their requests as your team completes repairs. Monitor the maintenance status of thousands of assets with a simple color-coded, red/yellow/green "stoplight" indicator grid. Manage keys and security for your assets, so you know exactly who's had access and when. Builds on the features in Basic Inventory, adding stocking levels, reorder points, and storage locations. Also allows you to track various units of measure for a single inventory item. For example, you might purchase oil by the barrel, but use it by the quart. Track which vendors provide which goods and services as well as when and how vendors performed. Also links vendors and work orders. Easy customization on the fly. Adjust layouts, add custom fields, create nested fields, and link custom prompts. Track the important metrics that help you understand the true life cycle costs of your assets. Create budgets for cost centers and measure your performance against them. Quickly and easily move data in and out of MPulse using a familiar, intuitive interface. Compatible with a wide array of file and data exchange formats, and meets virtually any data integration need. Monitor multiple meters (e.g., revolutions, psi, and hours) on a single asset, then trigger work orders based on threshold readings defined for those meters. Monitor work orders, reorder lists, and requisition records, then produce requisitions or POs as needed. 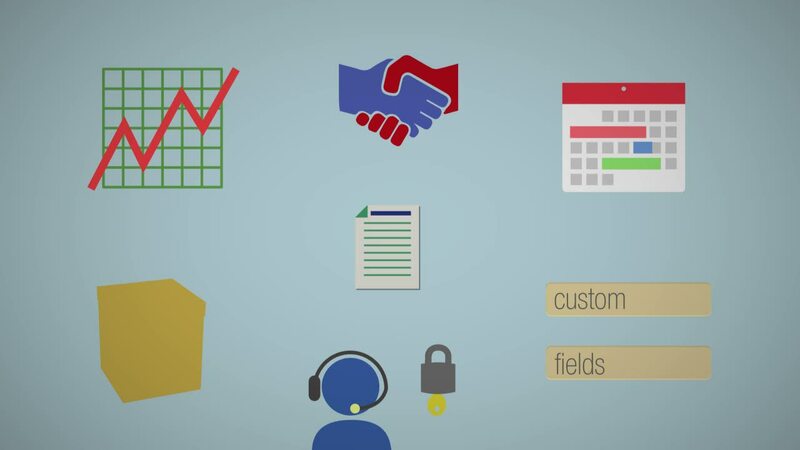 Easily track orders and requisitions all the way through receiving and restocking. With this intuitive, easy-to-use “shopping cart” tool, you’ll always have an accurate count of the parts coming and going from your spare parts room. Automatically filter maintenance requests based on predetermined criteria, then route them to appropriate personnel for review and approval. Create multiple status boards for multiple locations, cost centers, systems, or departments. Gives you precise, field-level control over which user roles see which records in MPulse.